Primo freemix V2 wheel with hub guards. The Primo Freemix wheel features the Primo freemix hub built.. The N4FL V2 Front Wheel features a Primo N4FL V2 front hub with flangeless 6000 series aluminum hub ..
A rear cassette wheel featuring the Remix V3 hub, Balance V2 rim, and 2 hubguards. .. The Freemix Wheel features a Primo VS double-wall rim and a Primo Freemix freecoaster hub with a CNC.. 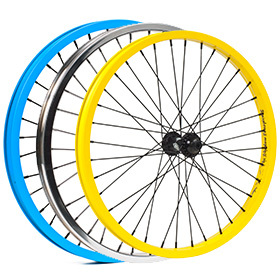 This wheel features a Freemix freecoaster hub laced with forged spokes to a VS rim. Polished Hub wit..
Pairing the amazing Shadow Symbol front hub with the impressive Shadow Truss rim to create an unmatc.. The Shadow Symbol Cassette wheel pairs the value and reliability of our Shadow Symbol cassette with .. The Crux Wheel features a 9T 14mm sealed rear cassette hub and a double wall pinned seam rim. Spe..